Leading regional and international experts explored the prospects of innovation and smart technology in the growth and development of the global maritime sector during the second edition of the Maritime Future Leaders Seminar. The UAE Maritime Week 2018 today (October 30) held the seminar which was successful in defining a clear road map to explore the best ways to promote the international maritime sector in line with the evolving requirements, once again highlighting Dubai's position as one of the most important maritime capitals in the world. 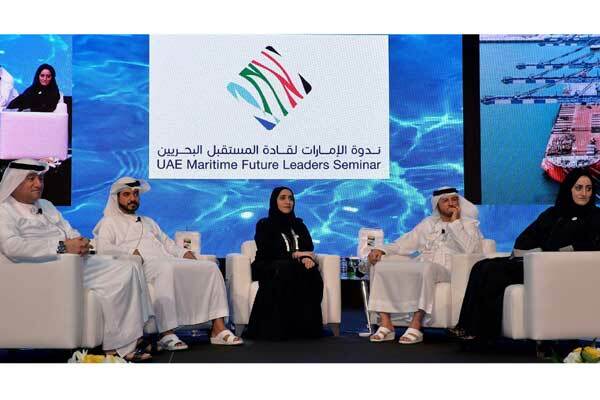 The seminar provided a first-of-its-kind platform for Emirati maritime leaders to explore the reality and future of the maritime sector from a new perspective of innovation, smart transformation and sustainability. The panel discussion was led by Nawfal Al Jourani, director of Dubai Maritime Cluster Office with the participation of Engineer Hessa Bint Ahmed Al Malek, executive director of Maritime Transport, Federal Transport Authority (FTA) - Land & Maritime; Abdulla Bin Damithan, chief commercial officer at DP World; Abeer Alshaali, executive management officer of Gulf Craft, and Captain Taleb Al Yamahi, deputy harbour master, Port of Fujairah. “The panel discussion that featured the leaders within the UAE maritime sector is a highlight of the second edition of the event. The session underscored the outstanding achievements of the UAE and the Emirate of Dubai on the international maritime landscape,” he said. “We are honoured to host such extensive panel sessions about global issues, including smart shipping, fuel, cyber security, research, development and innovation, highlighting Dubai's pioneering experience as a global model in developing one of the world's most innovative, unique and competitive maritime communities. We look forward to further strengthening communication with strategic partners to drive the growth and development of the maritime industry in accordance with the requirements of the digital era,” he added. The seminar agenda included four other interactive sessions as well, which attracted a high-level of participation from the UAE, regional and global maritime leaders. The first session led by Jorgen Strandberg, general manager of New Technology at Wartsila Voyage Solutions, focused on smart shipping’s advantages compared to traditional shipping methods. The second session discussed the challenges of fuel shortages until 2020 and the best ways to address them, which was led by Timothy Wilson, principal marine consultant engineer, FOBAS at LIoyd’s Register. The third session focused on cybersecurity and protection systems and was led by Jason Stefanatos, Senior Research Engineer at DNV GL. The fourth and final session was led by Kathrina Stanzel, director general of Interteco, which discussed the prospects of building a sustainable maritime sector based on innovation, research, education and the creation of successful global systems—with a focus on the ambitious plans that Dubai and the UAE are adopting to enhance their strong presence as a leading world class maritime centre. The UAE Maritime Week 2018 will run until November 1, highlighting the latest developments and showcasing the most promising solutions and opportunities that the local and international maritime sectors have to offer.